The Big Dog goes blue. The superstar shakeup continued last night as SmackDown rolled out its own acquisitions. 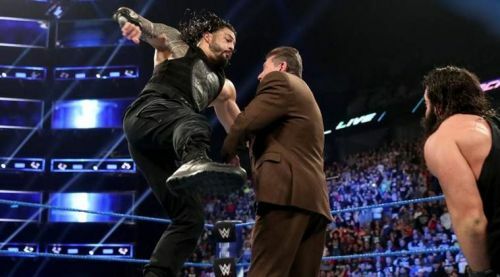 The show began by hyping the "biggest acquisition in the history of SmackDown." Elsewhere, SmackDown got a new face with gold around his waist, massive improvements to its women's division, and a 205 Live standout. Kofi Kingston look like he's getting his first rivalry for the WWE Championship. Kevin Owens became an "honorary member of the New Day" for now, but it seems probable that he'll turn on Kingston sooner rather than later. Money in the Bank comes in four weeks, after all. I haven't ever been much a fan of Kevin Owens in the main event picture, but this was off to a good start with a nice segment and a decent match later. Kevin Owens vs. Kofi Kingston will be a fresh matchup, at least. We'll see where the story develops from here. This was a long overdue change. Finn Balor should have been sent to SmackDown last year. Now he finally has the new start that he's needed, and he's bringing the Intercontinental Championship with him. Annoying name change aside, "Ali" again showed why he should be a fast-rising commodity this year. This match had the potential to be great, and was easily the night's best showing, though the commercials hurt it somewhat. I wouldn't be opposed to seeing this on pay per view at all. Aside from "Ali", Balor has a lot of new opponents to choose from on the blue brand. Losing Samoa Joe was indeed a blow for SmackDown, but the damage should be mitigated if the blue brand gives us some of those promising matchups.